The bells in the tower of Grace Church now number twenty, a complete carillon, and they furnish a full chromatic scale covering an Octave and about two-thirds, or exactly from the lowest toned bell B flat to F natural above the second C, for the highest tone. The eleven former bells have been recast to perfect pitch and tone color with the nine new bells. The first ten bells were played for the first time on Easter morning, 1873, the eleventh bell on Easter morning 1916, and the last nine bells, the complete carillon, on Easter, 1925. The complete mechanical playing action for the bells was given by Mrs. Francis C. Huntington. 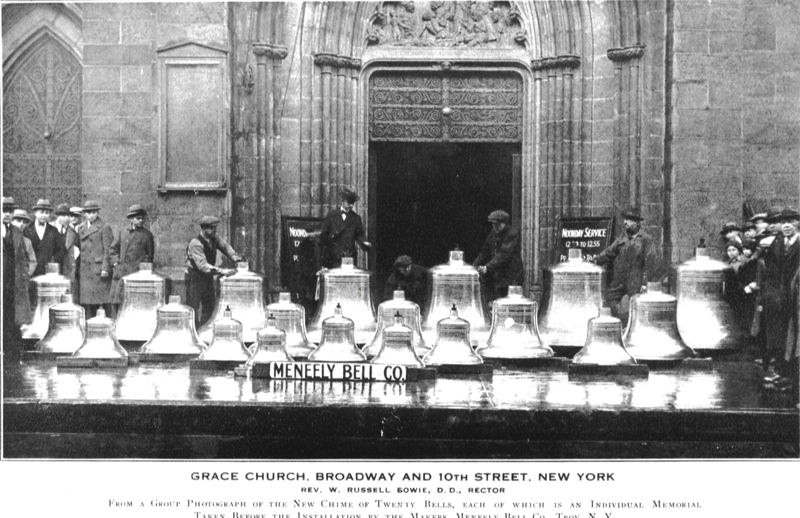 It is largely owing to the devoted interest of Miss Mary H. Gilles, assistant organist of Grace Church, that the new memorial bells were given. The Reverend Thomas House Taylor, D.D. By Members of the Congregations. 2. John David Wolfe (Warden). 4. Edward Renshaw Jones (Warden), and Edward Jones (Vestryman). By Florence and Watson Dickerman. By William Rhinelander Stewart and Lispenard Stewart. 15. Augusta Berwind and Infant Son. By John E. and Katharine M. Berwind. 17. Frank Spencer Witherbee and Lispenard Stewart Witherbee. 18. Henry Wheeler de Forest. By Henry W. de Forest and Julia N. de Forest. By Louise Dickey, Charles Denston and Lawrence Witherspoon Dickey. 20. May Toel Landon and Katharine Pratt Winchester. By Families of Francis Griswold Landon and Dallas Bache Pratt. The 20 bell chime (The cast bell chime is defined as a musical instrument possessing between eight and twenty-two bells, played from a keyboard. Instruments with twenty-three or more bells are known as carillons) located in the tower of Grace Church was cast in the year 1924 by the Meneely Bellfoundry of Troy, New York. In 1925 the mechanical playing action activated from a keyboard high up in the tower was replaced by an electro-pnematic high wind pressure action built by Ernest M. Skinner of Boston. The bells from 1925 until 1998 were played from a small keyboard located in the narthex of the church. The keyboard high up in the tower was removed. In 1998, the former electro-pnematic action was replaced by a modern electric system by the vanBergen Company. The bells were played from a small keyboard located next to the Schlicker Organ Console in the Choir. The Chime of Bells has been restored to the glory of God through the generosity of Mrs. Carter M. Braxton and Michael and Philippa Straus. Easter Sunday 12 April 1998. This playing system for the bells was first used on Easter Sunday 1998. It was struck by lightening during the Summer of 2010. In the fall of 2011 a new midi controller system was installed by the Verdin Company. It is through this system the Bells are now rung daily.